I've done the "my word for the year" thing several times and, in the interest of full disclosure, I admit by the end of the year I often couldn't remember what it was. So in the interest of exhibiting even a little bit of wisdom I decided to opt out this year. However, a couple of days into the new year a little word began to pursue me. Relentlessly! It simply would not be ignored. As I lay in bed that January morning praying - well all right, whining about how difficult the past year had been - I heard myself asking for joy. It surprised me because all the burdens of the past year had followed us into the new one. I wanted God to fix things - to help where we had been helpless. I opened my little Daily Light and read, "The joy of the Lord is your strength." Next I picked up my well-worn devotional, the one called "Joy and Strength" (A book so familiar I had forgotten the title.) and there it was again, "Then will I go unto the altar of God; unto God, my exceeding joy." I am reading Jesus Always with a group of friends.That morning I finally noticed the subtitle : Embracing Joy In His Presence. That day's reading began with: "I am your joy!" 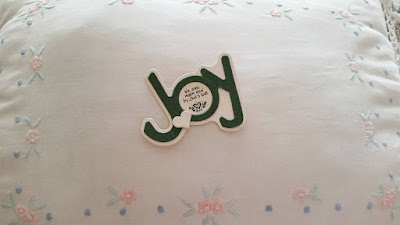 My word for this year is joy - one I would never have chosen. Could it be that the answer to all those fervent prayers is - joy? To rejoice with gratitude for all He is.